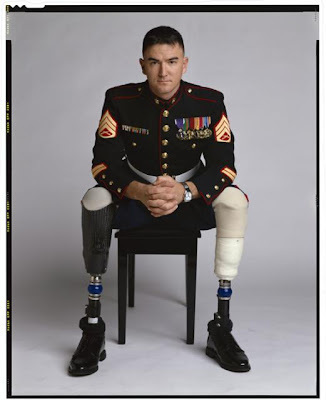 I posted at The Peace Tree today on the photo exhibit Wounded Soldiers and Marines by American portrait photographer Timothy Greenfield Sanders. Thank you for this incredible dose of reality here and on The Tree. By the way, I did not know that I posted on top of you today. I am sorry and have corrected my error. Mark: I may have posted over you. I'm always messing up like that! Sorry. I'll pay attention to the exact time of my slot next time. I have a question, though. Could you enable hyperlinks (isn't that what they're called? ), where the title of the post is linked so that readers go directly to that post instead of trying to rifle through several to get to the one intended? In a country where so much needs to be done we continue to support a military budget many times greater than comes close to being reasonable. This is a very powerful and emotive shot...where is this exhibition showing??? That's a sobering shot. I can't really think of much more to say about it than that. Other than I hope very soon nobody has a chance to take another one. Gone to Peace Tree and I've watched a video very disturbing too. You both ask us to open our mind, and our eyes on what many want to ignore. Sometimes, we need to. Sobering, indeed. When I saw these my first reaction was that I wanted to cry. But I sucked it up. Because they did. They didn't have to. I wish societies wouldn't sacrifice their members so recklessly. Thank you all for coming by for this one. I was just ranting about the corporate media trying to get us to pretend that the war isn't going on. Thanks for making people face it for a little while.